Hear-ye, hear-ye everyone must now bow down to the Mother of Bats. Her ancient powers make her capable of controlling the nocturnal creatures to do her bidding and she has them do all sorts of sinister tasks. For instance, she sends her beloved bat babies to collect blood from unsuspecting humans. Human blood keeps the Mother of Bats looking youthful and beautiful while also giving her the ability to maintain her powers. She drinks the blood and the more she drinks the more sensational her special abilities become. For example, when she's at full capacity with fresh blood, not only is she able to control bats, but she's also able to control the mind of any human being too. You don't want to mess with the Mother of Bats because she always gets what she wants...always! Right now the Mother of Bats wants to look fashionable. From what we can see, her powers have made her the most stylish vamp yet to date. With a see-through long sleeves on a full-length black gown, her new look is absolutely killer. She slays in this costume, complete with a large red collar and matching belt. Her cape attaches to her fingers with a finger loop. The ruby pendant in the center adds a dazzling, yet simplistic touch, to her bite-worthy ensemble. 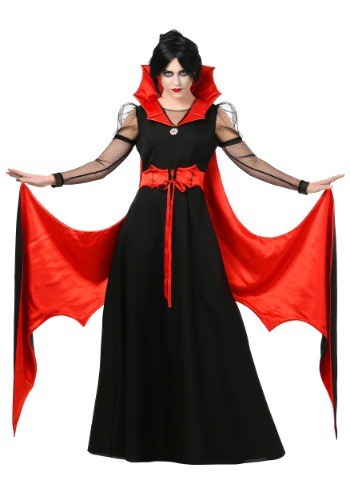 If you're thinking about venturing out into the blackness of the night, we recommend wearing this batty vampire costume. If looks could kill, you'll slay everyone you come into contact with, so sink your teeth into this ravishing costume this Halloween! great quality material not like that cheap material a lot of costumes have. The costume size and appearance were exactly as stated online however the Costume ripped after being only worn once for about 2 hours. The costume was better made than I thought it would be for the price I paid for it. Heavy material instead of something cheap and lightweight. I won first place at my party!